Besides being delicious, salmon is an exceptional source of Omega-3 fatty acids. Fish (salmon) is also a good source of protein and does not have the high saturated fat that fatty meat products do. In a small bowl, mix the maple syrup, soy sauce, garlic, garlic salt and pepper. 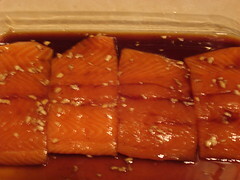 Place salmon in a shallow glass baking dish and coat with the maple syrup mixture. Cover the dish and marinade salmon in the refrigerator for 30 minutes, turning once. Place baking dish in oven and bake salmon uncovered for 20 minutes, or until easily flaked with fork. Maple Salmon was simple to prepare and quite tasty. 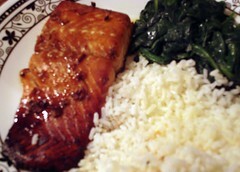 The maple syrup adds a nice, sweet flavor to the salmon fillets, while the garlic is making them happy, happy happy! The crispy, dark edges were a bonus. If I could do it again, I would have grilled the salmon instead of baking it. Mainly because the pan gets pretty crazy with baked on maple madness, not because the outcome wasn’t tasty. A slight change to the average pasta salad makes a huge difference. Very simple assembly. With a satisfying result. Put all vegetables in a large bowl. Pour some dressing over them. 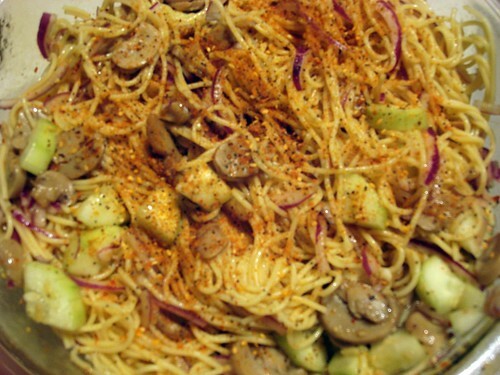 Top with noodles, Salad Supreme Seasoning and the rest of the dressing. Mix it all together. Shake a little Salad Supreme Seasoning on the top and chill. 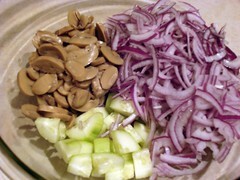 I tend to favor a cucumber, celery, mushroom and red onion combination. The red onion is almost a must for adding beautiful color to the salad. And the mushroom, mmm…self explanatory. Don’t get me started. All the other ingredients add a fresh, crisp crunch that no pasta salad should be without. Tonight though, I absentmindedly forgot the celery. I think because I was on a Spaghetti Salad making marathon of some sort today, making it for my Grandpa’s 89th birthday party in the morning then running out of time, I set aside some of the cut-up vegetables to prepare another batch later for my own crew at home. Some. Poor neglected celery. Apparently I couldn’t be bothered to cut up a couple extra stalks this morning, nor could I be bothered with it tonight. D’oh. 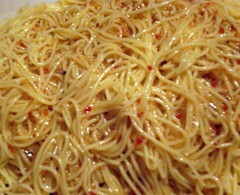 The Spaghetti Salad still tasted great, but it was lacking it’s crunch capacity. * I’ve found that a good way to measure 1/8 of a bottle of McCormick Salad Supreme Seasoning is to mark the side of the bottle with a Sharpie in 8 as equal as you can portions. This especially comes in handy if you’re an avid Spaghetti Salad maker.